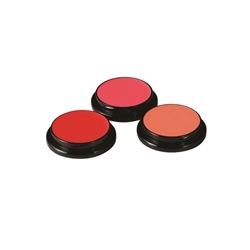 Creme Cheek Rouges radiate warmth and accentuate facial contours. Rich pigmentation assures versatility for intense coverage or natural subtlety. Ben Nye's primary creme shades, or "lining colors", provide rich style and detail to an actor's face, plus dimension and personality to his or her character. The Nye Creme Rouges, Highlights, Shadows and Color Liners offer an immense color range. Lining colors are formulated in the same satiny smooth creme texture and blend easily into foundations.